The Hand of the King was the second-most powerful man in the Seven Kingdoms. He spoke with the kingâ€™s voice, commanded the kingâ€™s armies, drafted the kingâ€™s laws. Robert was offering him a responsibility as large as the realm itself. It was the last thing in the world he wanted. 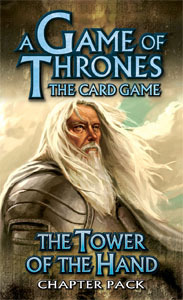 The Tower of the Hand is the third monthly installment of 60 fixed cards for the Kingâ€™s Landing expansion to the A Game of Thrones card game, based on George R.R. Martinâ€™s best-selling A Song of Ice and Fire saga. It contains 20 different never-before-seen cards designed to augment existing decks and add variety to the A Game of Thrones metagame.